PL/SQL offers three types of collections - associative arrays, nested tables, and varrays - each with their own characteristics and ideal use cases. If you are not already using collections on a regular basis in PL/SQL, you are really missing out. Use this article as starting point for accessing a number of useful resources for getting up to speed on collections, and putting them to use in your programs. The PL/SQL User Guide offers detailed coverage of collection features here. It starts by reviewing the differences between collections types. New to 18c: Qualified expressions for associative array: it's just one new feature for collections, but it's a great one - essentially constructor functions for this type of collection. Plus I wanted to show you that even this "late in the game" as 18c, we are still enhancing collection functionality. LiveSQL offers 24x7 access to the latest version of Oracle Database. You can "play around" with SQL and PL/SQL in a scratchpad environment. It also offers a code library. There are literally dozens of scripts in that library that focus on various aspects of collections. Start here and then tune your search accordingly. 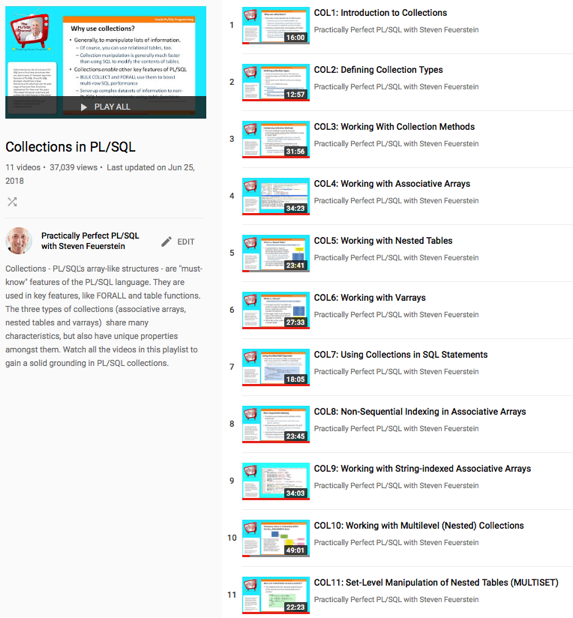 An 11-video Youtube playlist on my Practically Perfect PL/SQL channel. Just to give you a sense of the depth of coverage, total time is over 4.5 hours. 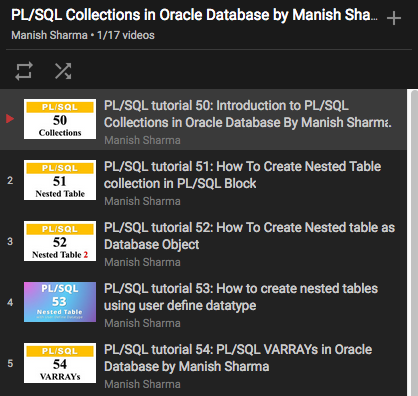 Manish (aka, Rebellion Rider) is one of the most prolific publishers of videos on Oracle PL/SQL. Check out this 17 video playlist for fast, basic videos on various aspects of collections.